I have been on a scrapbooking roll this weekend. And it all started with a sketch! 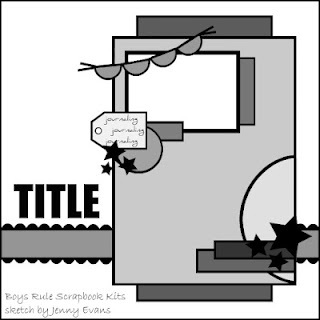 I found this sketch on the Boys Rule Scrapbook Kit website. Pretty awesome sketch...and you all know how I love a good sketch! Now, on my layout I added a little from the sketch, too away some. Basically I made it mine. This photo isn't the best quality - its an Instagram photo of Ben while he was at Leadership Camp for Boy Scouts. To help bring in the colors of the photo, I added in some October Afternoon 9 to 5 papers. To help bring in some dimension, I added a few Studio Calico veneer stars...and a cute veneer boy. Add some stitching, and an older Making Memories Cork Alphabet and you're done! Fun page thanks for the template! 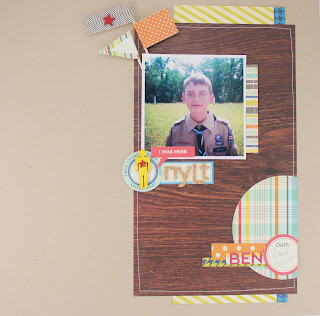 Your paper choices are perfect for the theme of this layout! great take on the sketch, I can never stick strictly to them either. I love this line! Great LO! Love the design on this! Great page! Great take on the sketch! Great layout! Love the papers you used! !